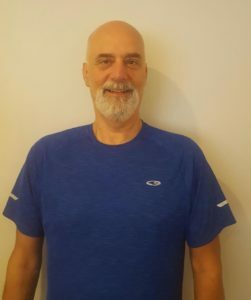 Steve is a Certified Personal Trainer from the National Academy of Sports Medicine, (NASM-CPT) and a Health Coach with Take Shape for Life/Optavia. He spent 30+ years at a desk job. In 2015, he decided to come to Healthy Weighs Wellness Center for nutritional counseling, after seeing Dr. Julie give a talk at his company. By this time, he had become overweight and was suffering from all the maladies of a prolonged sedentary lifestyle. Beyond weight loss, he took advantage of many of the different services available at Healthy Weighs Wellness Center including: acupuncture, massage therapy, Reiki, and yoga. Because he saw such great results and enjoyed interacting with the staff so much, he decided to make a career change. Experiencing the benefits that physical exercise added to his health and well-being and how they complimented the other treatments, he became a personal trainer. He is especially interested in working with people who, like he, prefer getting their exercise from doing things that are fun! Steve is available for personal training by appointment only. Please call (203) 775-1819.